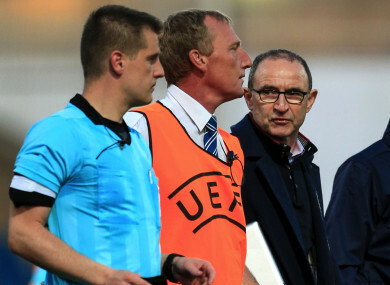 Martin O'Neill speaking to referee Zbynek Proske after Ireland's defeat to the Netherlands in the European U17 Championship quarter-finals. MARTIN O’NEILL HAS expressed his sympathy for the Republic of Ireland’s U17 team after they were eliminated from the European Championships in controversial circumstances earlier this week. Colin O’Brien’s side were beaten by the Netherlands at the quarter-final stage in Chesterfield on Monday. After the sides played out a 1-1 draw, the Dutch advanced via a penalty shootout. However, Ireland’s cause was hampered significantly by the decision of referee Zbynek Proske to send off goalkeeper Jimmy Corcoran during the shootout. After making what seemed likely to be a crucial save from Daishawn Redan’s effort, Corcoran was shown a second yellow card for encroaching from his line. When the penalty was subsequently retaken, Redan beat defender Oisin McEntee — who had to replace Corcoran in goal — to dump Ireland out in heartbreaking circumstances. O’Neill, who attended the game with assistant Roy Keane, discussed the incident at yesterday’s launch of the 2018 FAI Festival of Football and AGM in Cork. “Roy and myself went into the dressing room afterwards,” said the Ireland senior manager. “Obviously it was a scene of devastation. The young boys were absolutely in bits. After the shootout, O’Neill left his seat in the stand to console Corcoran and his team-mates on the sideline. Along with U17 manager O’Brien, he then approached the referee to make his feelings known. According to FAI chief executive John Delaney, who is also a member of Uefa’s executive committee, O’Neill won’t face any disciplinary action for entering the field because he attended the game as a spectator and not in any official capacity. O’Neill couldn’t see any difference between Jimmy Corcoran’s positioning and that of Joey Koorevaar when he saved Ireland’s first penalty, taken by Adam Idah. Koorevaar was the Dutch hero again against England on Thursday night, saving Folarin Balogun’s penalty in another shootout to send the Netherlands into tomorrow’s final against Italy. “If you look at it, and you look at the penalty save that the Dutch goalkeeper made for the first penalty [against Ireland], there’s nothing between the two,” O’Neill said. Email “O'Neill: 'Holland knocked England out and the Dutch goalkeeper was about 15 yards off the line'”. Feedback on “O'Neill: 'Holland knocked England out and the Dutch goalkeeper was about 15 yards off the line'”.